First some clarifying information about where I live. I live in Finland, my mothertongue is Swedish. My second language is Finnish. Finland is a bilingual country, very similar to Canada. The Finnswedes have lived along the western and southern costs of Finland for hundreds of years. We have strong bonds to Sweden, stronger than to Eastern Finland. Our culture has much in common with Swedish culture in Sweden. We have our own Finnswede media, but we also watch Swedish television, read Swedish books and magazines, listen to Swedish radio, but, and this is where we are oh so Finnish: we cheer for the Finnish sportsmen :) What could say more about a people than that? And now to the matter of this blogpost. Bosnian crochet is a technique where you use only slip stitches. By crocheting through the back or front loop, and by adding color, you can crochet quite nice looking things. The technique is best suited for small garments like mittens, gloves, and hats. It might have developed from tambour work, a way of embroidery where you use a small hook to draw the yarn through the cloth. I wanted to compare five related techniques, so I crocheted five purses with the same yarn, Novita 7-veljestä, and a pattern with 3+3 stitches and 4 rows. I will not go into details about the purses, because I think the photo tells a crocheter pretty much. A few things though: Bosnian crochet in the front loop looks very much like knitted purl stitches (purse 3). This confused Swedish textile people when they first started analyzing garments in the museums in the first decades of the 19th century. Bosnian crochet had fallen into oblivion almost everywhere, but luckily there were still people who knew the technique. In purse 3) you can also see a typical design in Bosnian crochet with two colors, the way the stitch divides the pattern. There are 3 stitches in each motif, believe it or not! 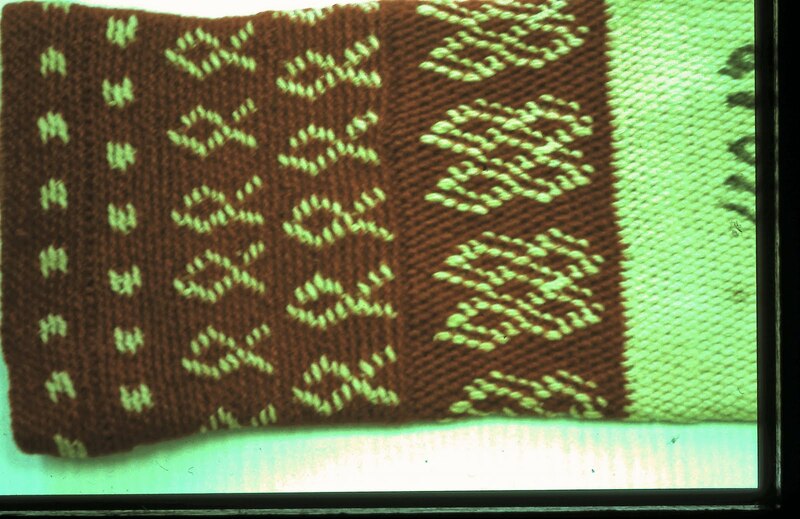 The pattern also slants to the right, and this is something that is often used to create patterns in Bosnian crochet. You can see it in the photos of the cover of the Swedish book, and the glove in my Swedish blogpost. You can see the hooks I used in my Swedish blogpost. The flat aluminum and wooden hooks are of a type that was often used in Bosnian crochet at least in Scandinavia. The crochet hook is the Aero 3,5 mm I used in three of the purses. Hooks for Bosnian crochet were often made of old spoonhandles, sometimes silver, and with beautiful ornaments. I know at least one person who has made a hook in that way. I very soon found that crochet terminology is not quite established, and that misunderstandings can spread very fast in blogs and the internet. I also found there is very little written in Finnish and Swedish about Bosnian crochet in the area I was interested in, the coastal area of Ostrobotnia (Swedish Österbotten, Finnish Pohjanmaa) in Finland. As the guild's editor was interested in an article about Bosnian crochet, I started writing it. I added information about Bosnian crochet in Europe. Lis Paludan, the Danish textilehistory scientist who is especially learned in crochet, wrote her book "Haekling" about European crochet in the '80s. She has one chapter about Bosnian crochet in her book. The book was later translated into English, and published by Interweave Press under the name "Crochet, History and Technique". From what I read in other books, especially from Sweden, it seems that most of the texts goes back to Paludan. I could have found much more about this technique if I knew more languages, such as Bosnian. Lis Paludan traveled through Europe in the '80s and looked at crocheted items in the museums. She found no crocheted pieces older than the late 18th century. Bosnian crochet seems to be older than other forms of crochet, and to be concentrated to the peripheral areas of Europe: Bosnia, Balkan, the Scandinavian countries, Scotland, the Baltic countries. In the 19th century, and also in the 20th, Bosnian crochet was often crocheted very loosely, and then felted. That made strong, warm and soft garments. After I had finished my article, I learned from Caprifool in Sweden that his grandmother used very tight Bosnian crochet for workmittens. She felted and then brushed the finished mittens to be even stronger and durable. She and Caprifool used to have crochet competitions, sitting on their front porch crocheting away the fastest they could :) They used crochet hooks of the kind we are familiar with nowadays. And that is about all I found. I asked people on a couple of Finnish Ravelry-forums for more, but nobody knew anything about history, even if a couple of crocheters were familiar with the technique. Now, what about the word "krokvirkning" that confused me? Well, the terms for Bosnian crochet in Swedish are many. 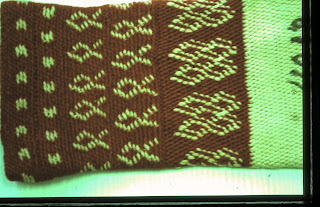 We call it smygmaskvirkning (=slip stitch crochet), gammelvirkning (=old crochet), påtning (I have no English word for this, but it's a technique used for making cords and for nålbindning aka nalbinding), gobelängvirkning (=gobelin/tapestry crochet), bosnisk virkning (=Bosnian crochet), and krokvirkning (=hook crochet). "Kärt barn har många namn", as we say in Swedish. A dear child has many names. The most common term right now is smygmaskvirkning. The Scottish/English term shepherd's knitting for Bosnian crochet is also a bit confusing, as it is clearly a crochet technique. The term has been in use since the late 18th century. "Bosnian crochet" of course indicates the area where the technique has been widely spread. This little excursion into the world of crochet terms taught me, besides my first rows of Bosnian crochet, that crochet terminology is far too big a field for an amateur to try to explore in a few weeks alongside all the other things in life that have to be done. But it was a fun place to visit. If some of my readers have more information, or want to correct mistakes or misunderstandings (there must be some, as I have no one who could read this through before publishing), I would be happy if you let me know. I would gladly return to the subject later. Thank you SO MUCH for taking the time to write this up in English! Tak for et meget interessant indlæg/ Thank you for writing about this. It's very interesting. I'm glad you liked it! Merete, do you know if Paludan's Haekling is ever sold (second hand of course) in Denmark? I'm very interested in a copy. Norsk går bra! Jo, "pjoning" används både på norska och danska. Du har rätt, det är inte lätt att hitta historia om den här tekniken. Den nämns i flera källor, men längre texter har jag inte hittat på svenska och finska. Jag har inte sökt så mycket på andra språk, eftersom jag mest är intresserad av smygmaskvirkning i Österbotten. Men Norge är väldigt intressant i det här sammanhanget. Vad har du hittat? Du har väldigt fina produkter, tack för länken! Spennende å lese. Har også lett etter informasjon om pjoning på ulike steder, men synes det er vanskelig å finne fram til noe. Har lyst til å lære mer. Har pjonet noen vottepar den senere tiden med utegangspunkt i et hefte om pjoning som er utgitt av Museumshåndverkerne. Der har jeg også kjøpt en pjonekrok. Tack för länken! Det är verkligen spännande med den här tekniken. Det är så många som känner till den, och så litet skrivet. Amigurumi - du menar de små oftast virkade maskotarna? Har ordet någon annan betydelse också? Accurasy is incorrect; should be accuracy. While English does run some words together as one, mother tonuge is not one of them. In the phrase, "even if me and my wonderful Finnish husband ... have communication problems ...", you should write 'I', not 'me'. As my mother always harped, "Nominative, not objective!" - speaking of the case of the pronoun. Not enough errors to impede comprehension! Question: What do you mean by "2) single crochet (double crochet in UK) in the back and in the front loop"? Do you mean that each stitch is worked alternatively through the front and then the back loop of the next stitch? I've got to try that! Your question: if you look close at the photo you'll notice that the stitches form checkerboard squares. I crocheted 3 single crochet stitches in the front loops, 3 in the back loops for 4 rows to form a square. Next 4 rows: 3 in the back loops, 3 in the front loops. Hope that helps! Hillevi3, haluaisin tietää, jos on olemassa jokin suomalainen virkkausohjeita, jotka ovat Englanti? Olen osa Suomen, olen rajoitettu kielimuuri. Edesmennyt Mummo Allingtonin, oli Suomi ja meillä on serkkuja vielä siellä, mutta en tiedä, keitä he ovat, edesmennyt mummo sanoi hänen veljensä on edelleen olemassa, mutta se oli vuonna 1994, mummoni läpäissyt vuonna 1998. Joten voisitteko lähettää minulle oikeaan suuntaan, miten voin jopa Tain Suomen virkata malli muisto mummo? I hope you can read English! The grand old lady of crochet in Finland is Mary Olki, who published several books in the 20th century: "Virkattuja vuodepeitteitä", "Uusi pitsikirja", "Virkattuja peitteitä ja hartiahuiveja". There is one book in English, "The Handicrafts of Finnish Women" published in 1952, which I think also has some crochet patterns. Have a look at Amazon, there are 2 used copies just now when I write this! If you are a skilled crocheter you can find out from the photos how to crochet most of the patterns, so don't be afraid to buy them in Finnish. Some are still in print. Good luck! Best for learning all the stitch pattern variations with free pattern for small purse i have made with an ordinary crochet hook but would like to try with proper pjoning hook. Finns det nåt nytt då?